I am looking for a roll of this wallpaper. Can anyone help? It is about 4 years old, but I don't know what it is called. Do you remember where you purchased it? If you bring the swatch there they could identify it. Otherwise, take it to a wallpaper store. You might get lucky and someone will remember it. 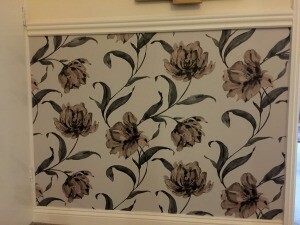 Take the photo, of this wallpaper, to various stores, and compare it to their sample books. Also ask to see similar wallpaper.